I wonder how many times a day I ponder, “How did we find ourselves in this political quagmire?” In an attempt to understand, I read evaluations of Hillary’s campaign, cultural Appalachian anthologies, studies of Chiefs of Staffs and their role in our government, etc. I was still flummoxed by our current condition. We are an intelligent country. I cling to the values that have identified us to the rest of the world for so long. But, why and how did we get here? Many of you read Dark Money: The Hidden History of the Billionaires Behind the Rise of the Radical Right, by Jane Mayer. I reviewed it a few months ago. In it, we were introduced to the Koch brothers and how their family ideology and money was undermining our democracy. We were rightly shocked. He believed that growth of government undermines individual freedom. Government overreach, he maintained, included public schools, the Postal Service, prisons, labor laws, Social Security, Medicare, Medicaid for the poor, guarantees of voting rights, foreign aid, the Environmental Protection Agency, and the graduated income tax. Government’s only role, Buchanan and his followers believe, “is to ensure the rule of law, guarantee social order, and provide for the national defense.” He was backed by wealthy libertarians; and embraced by exclusive think tanks, such as the Mont Pelerin Society, the Hoover Institution, the Cato Institute, the Club for Growth, and the Heritage Foundation. Not surprisingly, he was funded by Koch. An enticing tidbit was Buchanan’s writing of a constitution for the Chilean dictator Augusto Pinochet. This was a document that ensured constraint of majority power, helping lead a push to undermine their trust in public institutions. Does this power play sound familiar? It was the counter punch to the New Deal, integration, even capitalism itself. He taught his followers that “conspiratorial secrecy is at all times essential”, to make efforts to protect the wealthy elite from the will of the majority. 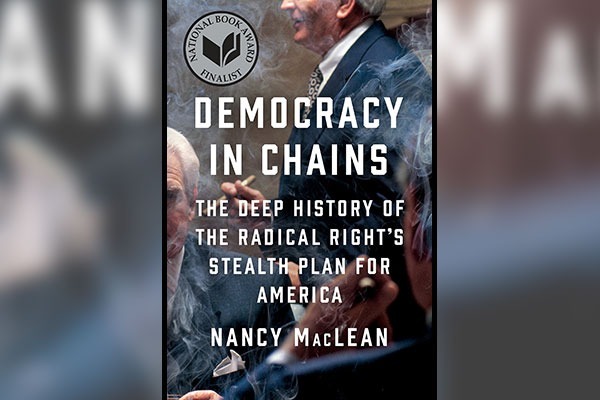 Nancy MacLean has been criticized since her book appeared in June 2017, that she misused sources and that focusing on Buchanan leaves the story only partially told. But even given these comments, her questions remain important and well worth our consideration. MacLean nevertheless adds important elements of the information we need to understand our adversaries and the political battlefield we occupy. The Koch brothers must not have imagined the Trump presidency as their endgame. This is bigger than any one president. This movement is an effort to rewrite the social contract and manipulate citizens’ beliefs. Add to this interference from foreign powers, and we have our work cut out for us. Our democracy is under attack from many sides. What we think of as dysfunction is the result of years of strategic effort. I’m so glad you discovered this book, Karyn. How did you discover it? I haven’t seen it reviewed by NYTimes, etc and am interested in the critiques you mention. It is a chilling explication of how this relatively small group of people have been so successful in enacting their agenda to the detriment of the rest of us. They are playing the “long game” and this book is a good roadmap as to how they did it and may help us develop our own strategies.